Check out the Purple Heart Recipients Memorial bus wrap (click this text). SightLine offers high quality business cards. Full color 16pt high gloss UV coated as well as higher end specialty cards such as Silk Laminated, Spot UV, custom cut, and more. Give us a call today. Click the ExpoGo logo to see the display products catalog. Contact for discounted pricing on any of the products. Please browse around our site to see more about the various products and services we offer as well as many example photos. Thanks for visiting! Welcome to SightLine Signs & Graphics. 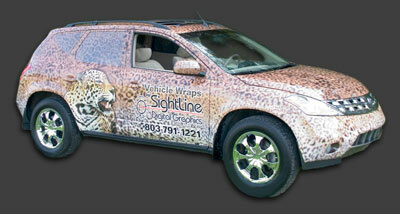 SightLine Signs & Graphics produces ultra high quality wide format digital prints. We are ideally suited for producing commercial graphics for many indoor and outdoor applications. We assist businesses in promoting their products and services through high quality full color digital mediums. From Business Cards to Full Vehicle Wraps and many others in between - we aim to please. Get a box of 1000 top quality business cards for just $49.00. Our cards are the best around - heavy 16 point card stock, full ultra high gloss uv coated, or smooth matte finish. We also have other business card options available such as 2 sided, spot UV, silk laminated, and special waterproof and tear resistant cards. 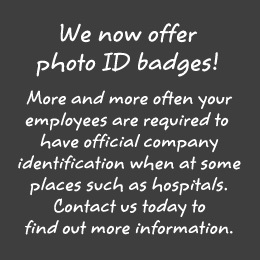 Another of our new offerings is employee ID badges. The front of these (and optionally the back as well) are full color printed with your company logo, employees name, and a photo of the employee. The back can optionally be left blank, or printed with a barcode, encoded with a magnetic stripe, whatever you want. ID badges add a tremendous level of credibility and professionalism to your staff members. Particularly when your staff will be on site at customer locations. This gives your customers an extra level of confidence that the person they are interacting with is who they claim to be. Additionally optional barcoded and/or magnetic encoded cards can be used with many time systems and door access systems. With our new low volume full color digital press SightLine also now offers economical short run posters and prints up to Tabloid Extra 12" x 18" side on up to 80lb gloss cover stock as well as full color short run flyers and prints (1 or 2 sided) from 8.5" x 11" high gloss flyer stock to legal, tabloid, and tabloid extra sizes. Please explore our site to find out more about the many things we do and sevices we provide. Explore our gallery to see some of our work and projects. From idea design to installation and everything in between - SightLine is always on Target.